The East Tower is located in Zhujiang Xincheng, the new CBD of Guangzhou city. The site of the East Tower is right opposite to the West Tower which is approaching its final stage of construction. 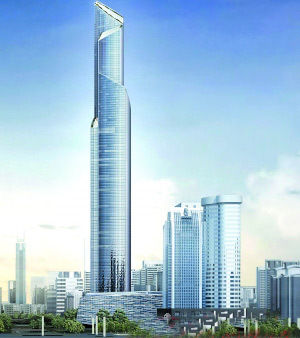 The East Tower, which will stand at 530 metres, began construction on September 29. The tower will have a total floor area of 398,009 square metres. Externally, the tower will have fully glazed facades in light blue colour with some darker strips in several places on the tower. Upon completion, the tower will have 4 storeys of underground parking providing 1,700 spaces, a 5 storey podium and a further 120 storeys. The tower will be home to 212,533 square metres of premium grade office space, 96,518 square metres of residential space in the form of serviced apartments, 55,120 square metres of commercial space along with 33,836 square metres of space for a 290-room luxury hotel. The total investment of the East Tower will cost over RMB10 billion. The project is scheduled for completion in 2016.